Ajay Mathur | OK Listen! India-born and Switzerland based singer-songwriter Ajay Mathur’s music doesn’t fit a particular music genre, as the melodies and lyrics take on a life and style of their own. 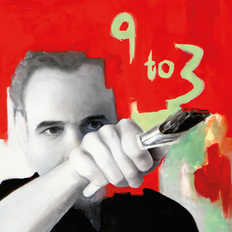 The new album '9 to 3' follows Ajay Mathur's previous successful releases of ‘A Matter of Time' (2011) and 'Come See Conquer' (2013) which have enjoyed excellent reviews and acknowledgements in the international media, top-rankings on internet radio playlists, chart ranking on Americana (AMA) radio charts, four award-winning singles including 'Communicate' which was a finalist in the 2011 Show Me the Music song-writing contest and 'Easy' as a finalist in the 2012 Unsigned Only Songwriting Competition and over a million fans and listeners worldwide. Mathur celebrated success in his European home of Switzerland with his rock group 'Mainstreet' in the 80s and 90s.